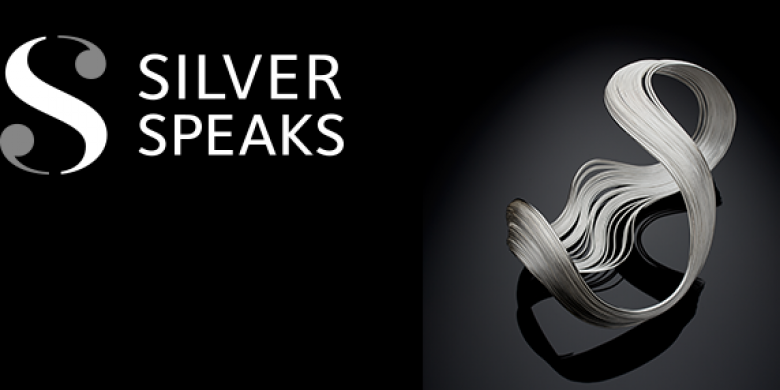 Silver Speaks is a year long programme of events around the country to celebrate the exceptional level of creativity and skill in British silversmithing today. The spotlight will shine on some of the most exciting artists and designers – exploring the diverse applications of the material, from the experimental to the traditional, the sculptural to the functional. It will showcase the remarkable uses of silver and how works can be commissioned to enhance contemporary living, architecture and fashion. The programme of events has been organised by Contemporary British Silversmiths, the leading association for design-­based contemporary silver, which is sponsored by the Goldsmiths’ Company. 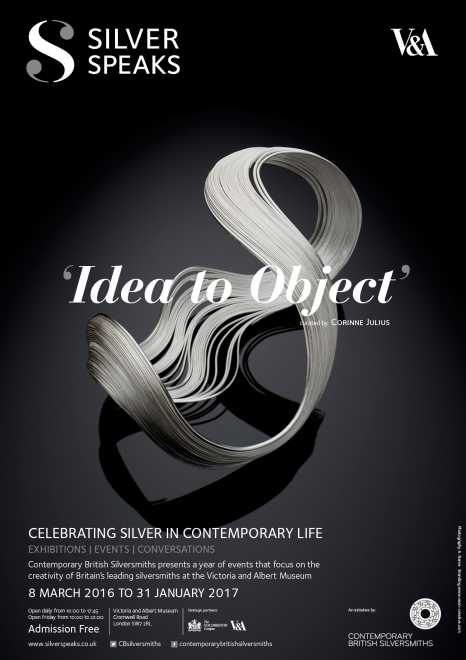 The focus of the programme, Silver Speaks: Idea to Object and the supporting public symposium Silver in Contemporary Life, are produced in collaboration with the V&A. Silver Speaks: Idea to Object traces how a work in silver is brought into being from the inspiration, through sketches, models, material experimentation and construction processes, to the final piece. The selected designs in this free display at the V&A encompass a variety of beautiful and intriguing objects – both sculptural and functional – created using a range of different processes, from the traditional to the most cutting edge. 18 of Britain’s leading silversmiths, all of whom are members of Contemporary British Silversmiths, have been selected by curator and critic Corinne Julius. They will display specially commissioned works at the V&A’s Silver Galleries from 8th March 2016 – 31st January 2017. The featured craftspeople include Rauni Higson, a former trapeze artist; Kevin Grey, a car-­maker who helped make the Sultan of Brunei’s series of unique Bentleys and Juliette Bigley, a health care manager for the NHS – who all went on to train as silversmiths. Curator Corinne Julius comments: “British silversmithing is at the forefront of contemporary craft and Britain is the world’s centre for modern studio silver. Silver has become a medium of choice for the expression of ideas. Silver fell out of favour but is now being rediscovered and enjoyed by a new generation. When Contemporary British Silversmiths asked me to curate an exhibition, I wanted to show not only what an extraordinary material silver is, with its myriad qualities, but also how silversmiths use a combination of head, heart and hands to produce their work. The idea behind the object, how that is developed, the story it tells and the processes used in its making, are inherent components of the final work.” Multidisciplinary designer and artist Marcin Rusak will work alongside Corinne Julius to design the installation. This event celebrates the joint 20th anniversaries of Contemporary British Silversmiths and the V&A’s Silver Galleries. To celebrate 30 years of commissioning contemporary British silver for its collection, The Silver Trust will be unveiling its latest exciting commission at the V&A. The Silver Trust, a registered UK charity, was founded in 1986 with the goal of supporting and showcasing the talented silversmiths working throughout the United Kingdom. Its work has been showcased through a loan of the collection, mostly to 10 Downing Street, where the pieces were conceived to be used for government entertaining. During the 30-­year history of the Trust, the collection has been seen around the world through a series of exhibitions. The Trust is honoured to work with many of the greatest silversmiths in building the collection and often partners with Contemporary British Silversmiths. Make is a one day silversmithing workshop offered to the public through the V&A’s learning events programme. Members of Contemporary British Silversmiths will give attendees the opportunity to create a small item in silver, from the design concept through to production. Form is an exhibition of work by members of Contemporary British Silversmiths. It will complement the Silver Speaks: Idea to Object exhibition at the V&A. Makers will be showing different skills and processes through their work and exhibiting some their favourite tools and techniques. Themes will include new technologies, decorative finishes, traditional techniques and engraving.